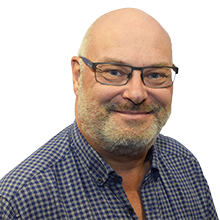 Veteran (he hates that) presenter Steve Orchard has worked at various stations since catching the radio bug back in 2003. Steve's one claim to fame is that he was in the same class at school (some considerable time ago) as ABC's Martin Fry and reminds us every time he plays an ABC song! He has a love of travelling, especially to the USA, having fallen in love with New York City a couple of years ago, but always likes to come home and see what damage the children have done to the house (a regular occurrence!). Steve started his radio career on hospital radio hundreds of years ago, back in the 7" vinyl days, and met his partner, the lovely Anne, there too - aaahh! Steve's currently learning to fly (an aeroplane), the cost the lessons means he has pushed his retirement age back to 107. Catch Steve weekdays between 10am & 2pm on Ipswich 102.